Kimberley Martin B.A. LL.B. (Hons), LL.M, TEP is a Director at Worrall Moss Martin Lawyers in Hobart, Tasmania. 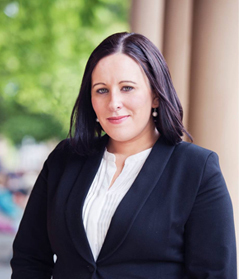 Kimberley’s range of expertise includes estate planning, tax, trusts and superannuation law, with a particular emphasis on complex needs, international, and high net worth estate planning. She also provides extensive advice in the area of charity law. Kimberley has a strong voice representing the legal profession at a State, National and International level through her involvement on committees, her published work, her professional presentations, and media exposure. She is one of two Australian members of the STEP Digital Assets Special Interest Group Steering Committee. In October 2017, she graduated with an LL.M (Masters of Applied Law) in Wills & Estates through the College of Law and, with the highest average mark in the national course, was awarded the prize of “Best Graduating Student” of her class. Kimberley has recently been announced as one of six finalists in the Society of Trust & Estate Practitioners (STEP) Private Client Awards 2018/19 Young Practitioner of the Year Award. Kimberley is the only Australian finalist in this award category, with the other finalists being based in the United Kingdom and the United States of America. This webinar is suitable for lawyers and accountants throughout Australia who advise in estate planning matters. This webinar is for practitioners with some knowledge in this area and looking to improve their knowledge. Live webinar delegates will receive a CPD certificate for attendance at this webinar. Accountants can claim up to 1.5 CPD/Training hours. Lawyers can claim up to 1.5 CPD units/points – substantive law. This webinar has been designed to run for 1.5 hours, however, webinar lengths can vary depending on the level of questions and discussion, and the minimum length of the webinar is 1 hour.